Beijing's successful bid for the 2022 Winter Olympics means it will become the first city ever to stage a summer and winter Games. The Chinese capital beat Kazakhstan's Almaty thanks to its "focus on sustainability, legacy and transparency", according to the International Olympic Committee (IOC). But human rights groups have described the decision as "a slap in the face". And others have a more prosaic concern: the lack of snow in Beijing. So what tipped the vote in Beijing's favour? And can they host a successful Winter Olympic Games and Paralympic Games? At the start of the bidding process, Beijing was seen as an outsider, due to its not exactly alpine climate and the fact that the 2018 Winter Olympics are also due to be held in Asia, in Pyeongchang in South Korea. But a succession of European cities, including Krakow,Oslo and Stockholm, withdrew from the race, citing low public support and concerns about the enormous costs of hosting the Games. That left just two contenders: Beijing and Almaty. Almaty ticked many boxes: the Kazakh city boasts snowy winters and plenty of money from the country's vast oil reserves. But while Kazakhstan has never before hosted a major global sporting event, Beijing was seen as a safe pair of hands, having hosted the 2008 Olympics. That was enough to see the Chinese capital over the line, by the slender margin of 44 votes to 40. Beijing is not a mountainous city, so the skiing, snowboarding and sliding events will be held in Yanqing, 55 miles away from the capital, and Zhangjiakou, 100 miles away - on the edge of the Gobi desert. But even these remote venues see minimal snowfall - Zhangjiakou averages eight inches of the white stuff per year, while Yanqing gets a miserly two inches. Even the IOC's own bid evaluation noted: "Due to the lack of natural snow the look of the venue may not be aesthetically pleasing." So, unlike wintry Almaty - which not-so-subtly trumpeted its major selling point with its cheeky campaign slogan 'Keeping It Real' - Beijing will be pumping out tonnes of artificial snow. Snow cannon will be used to super-cool water from nearby lakes and reservoirs and eject it as ice crystals. There is a precedent for this: the organisers of the 2014 Winter Olympics in Sochi - one of Russia's warmest regions - created enough snow to cover 1,000 football fields. But there are concerns over the environmental impact of this process: the Sochi snow-making system used enough water to empty an Olympic swimming pool every hour. Organisers have attempted to allay fears about the sustainability of the Games by pledging to use several venues from Beijing 2008, including the Bird's Nest Stadium and the Water Cube aquatics venue. There are also plans to build a high-speed rail link between the capital and Zhangjiakou, cutting travel time to just 50 minutes. But there are other concerns, not least China's poor human rights record. Human Rights Watch called the decision "a slap in the face to China's besieged human rights activists", adding: "The Olympic motto of 'higher, faster, and stronger' is a perfect description of the Chinese government's assault on civil society." The group cited particular concerns over the negative effect the 2008 Games had on civil liberties in China, including "a surge in the arrest, detention, and harassment of critics of the government, repeated violations of media freedom, and increased political repression". 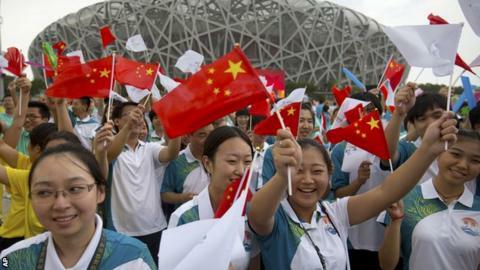 While the IOC praised Beijing's bid, others were not so enthused by the choice of host city. The New York Times said "serious problems" were posed by the selection of Beijing, adding: "It's a sad day when the International Olympic Committee cannot even clear one of the lowest bars for choosing the host city for the Winter Games: snow. "While the Almaty bid's slogan was 'Keeping It Real', Beijing's could have been, 'Keeping It Impractical'. The IOC obviously isn't aiming for authenticity." The Economist pointed out China's lack of tradition in skiing, the Winter Games' blue-riband event, saying: "The sport is still very much in its infancy: on an average winter weekend most of the skiers sliding down the fake snow at Zhangjiakou are beginners. "China not only needs to make some snow, it needs to make some gold medal winners too." British skeleton gold medallist Lizzy Yarnold told BBC Radio 5 live: "Beijing is a relatively warm place, and with the snow sports artificial snow does make a huge difference - it impacts the speed and they need to take that into consideration when designing the venues." Meanwhile, the Almaty bid accepted the decision magnanimously. "China has played a significant role in the development of sport in Asia," said bid vice-chairman Andrey Kryukov. "We know that they will deliver a great Games." Others may take a little more convincing.